Washington, D.C. August 4, 2016 /3BL Media/ – The Citi Foundation and America’s Promise Alliance announced today the selection of 12 nonprofit organizations as 2016 Youth Opportunity Fund grant recipients. The Fund – now in its second year – awarded an additional $3 million in support of programs that connect youth to opportunities that increase their employability and prepare them to compete and thrive in a 21st century economy. To date, the Fund has provided $6 million to support 24 organizations, reaching more than 7,000 youth. Launched in 2015, the Youth Opportunity Fund is part of the Citi Foundation’s Pathways to Progress initiative, and supports organizations that help empower urban youth, ages 16 to 24. The Fund awards one-year grants of $250,000 to nonprofit organizations in 10 U.S. cities: Boston, Chicago, Dallas, Los Angeles, Miami, New York City, Newark, St. Louis, San Francisco Bay Area and Washington, D.C. According to the U.S. Department of Labor, the unemployment rate for young people age 16-24 is 10.8 percent, with more than 6 million young people disconnected from school and work. The Youth Opportunity Fund supports programs that address youth unemployment through partnerships with select municipal governments and collaborations across industries, including IT, technology, healthcare, the service industry and environmental sustainability. The new 2016 cohort will add opportunities in construction, clean technology, and communications. Boston: Sociedad Latina will work with the Mayor’s Office of Economic Development and three other Latino-led organizations in Boston to help youth prepare for the workforce through skill-building and paid apprenticeships. Chicago: Genesys Works, in partnership with Chicago Public Schools, will provide students from low-income families with workforce training, along with a paid internship in the IT or accounting sectors, college counseling, and support for their transition to the workforce. Dallas: United Way of Metropolitan Dallas will work with the Dallas Independent School District and City Year to provide students from low-income families with support transitioning to post-secondary education and becoming workforce-ready, plus training in teamwork, critical thinking and financial literacy. Los Angeles: Los Angeles Conservation Corps, in partnership with municipal agencies, will help young adults from underserved communities pursue clean-tech jobs. The Green Career Pathways program will provide a paid work experience, specialized training, employment transition services, and the opportunity to earn “green jobs” certification. Miami: Greater Miami Service Corps will work with the Miami-Dade County government to launch Corps to Career, which will provide out-of-school youth who have participated in GMSC service-learning opportunities with the chance to apply what they’ve learned in paid jobs at county offices including the airport, hospital, and tourism venues. New York City: STRIVE will partner with the East Harlem Talent Network to train youth from low-income families in entry-level food service and hospitality jobs. The program, Serve UP Harlem, will provide youth with case management services, financial literacy training, and help exploring education options. New York City: Urban Upbound will work with the New York City Housing Authority to help young adults living in public housing earn credentials for jobs in the construction sector in their own community and build academic, financial and workplace skills. Newark: NPower will engage underserved students in Newark and Jersey City high schools to prepare them for high quality jobs in the technology sector. Through its Technology Service Corps, a workforce development program, NPower will provide young adults with technology and soft-skills training and apprenticeships at leading companies and nonprofits. St. Louis: Wyman Center will work with STL Youth Jobs to help young adults from low-income families find and succeed in jobs that provide financial stability. Students will participate in paid positions, job shadow opportunities, and career mentoring. San Francisco Bay Area: Youth Radio will prepare low-income young adults for Bay Area jobs in media and technology through intensive training, college credit (in partnership with Peralta Community College), industry certification (from the CA Division of Apprenticeship Standards), wraparound support, and paid job placement. Washington, DC: Per Scholas will work with the D.C. Office of Youth Programs to prepare young adults for jobs in the tech field. The Connecting the Path program will help youth become career-ready and provide industry certification and job placement assistance. Washington, DC: Year Up National Capital Region will provide young adults who are not in school and do not have a high school diploma with rigorous IT and communications training (through a partnership with Northern Virginia Community College) and an internship or college enrollment. 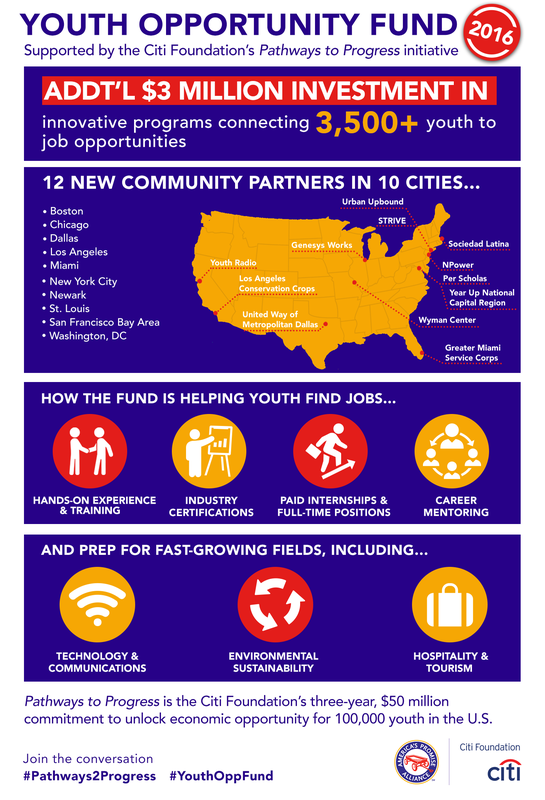 In its first two years, over 70,000 young people have been impacted by the Citi Foundation’s Pathways to Progress initiative, a three-year, $50 million commitment to give 100,000 low-income youth in the U.S. the opportunity to develop workplace skills and leadership experience. The initiative includes national organizations such as the Network for Teaching Entrepreneurship, Points of Light, AmeriCorps, Management Leadership for Tomorrow, iMentor and Cities for Financial Empowerment Fund. To learn more about the Youth Opportunity Fund and the 2016 grantees, visit: http://www.americaspromise.org/youth-opportunity-fund.